As Portuguese President Aníbal Cavaco Silva once put it, “A country without children is a nation without a future.” He was, of course, referring to his country’s ultra-low birth rate, which is just over 1.3 (Tfr) and has been below replacement level (2.1Tfr) since the early 1980s. In 2012 only just over 90,000 children were born in the country, the lowest number in more than a century – you need to go back to the nineteenth century to find numbers like the ones we have been seeing since the crisis really took hold. Nobel economist Paul Krugman recently suggested that among the ailments Japan was suffering from was a shortage of Japanese. Or put another way Japan’s slow growth is partly a by-product of the country’s ageing and shrinking workforce. Looking at the country’s population dynamics Portugal certainly looks a likely candidate to catch this most modern of modern diseases. 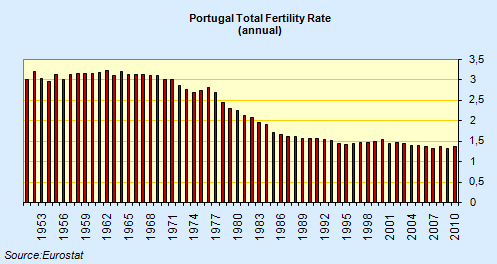 Not only does Portugal have the key ingredient behind the Japanese workforce shrinkage – long term ultra-low fertility – it has some added issues to boot. Japan may be immigration averse, but its inhabitants aren’t fleeing in droves. Of course, a shortage is always relative to something. Many hold that the planet is overpopulated, and that energy constraints mean fewer people would be better. So shouldn’t we be celebrating all these children who aren’t getting born? Well, no, at least not if you want sustainable pension and health system, and that is what the developed world sovereign debt crisis is all about, how to meet implicit liabilities for an ever older population. 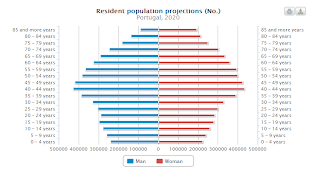 One thing Portugal won’t have a shortage of is old people, since the over 65 age group is projected to grow and grow, even as the working population shrinks and shrinks. No wonder the young are leaving, even if the youth unemployment rate wasn’t 38.3%, just think of all the taxes and social security contributions the remaining young people are going to have to pay just to keep the welfare ship afloat. Patriotism at the end of the day has its limits. Far from the recession getting milder as last year progressed it actually accelerated, and there was a 3.8% output drop in the three months to December in comparison with a year earlier. Naturally, it isn’t all bad news. Exports are doing extremely well. They were up by 5.8% during the course of 2012, and the really good news was an increase of almost 20% in shipments outside Europe – exports to countries outside the EU jumped 19.8% to13.1 billion euros. These now constitute nearly 30% of total exports, up from just over 25% in 2011. In contrast exports to other EU countries – where domestic demand is contracting rather than expanding – were up a mere 1%. In contrast retail sales were down nearly 10% on the year, construction output 15%, and industrial output 5%. This is a familiar picture across Europe’s southern periphery, where positive export performance does not compensate for shrinking domestic demand due to the smallish size of the export sector, generating a negative environment which ongoing reductions in government spending do nothing to assuage. I have established a dedicated Facebook page to campaign for the EU to take this issue more seriously, in particular by insisting member states measure the problem more adequately and having Eurostat incorporate population migrations as an indicator in the Macroeconomic Imbalance Procedure Scoreboard in just the same way current account balances are. If you agree with me that this is a significant problem that needs to be given more importance then please take the time to click “like” on the page. I realize it is a tiny initiative in the face of what could become a huge problem, but sometime great things from little seeds to grow. I know you are using random WordPress images. But, for me, today, the image is of the Electrico in Lisbon. Where are those emigrants going? What role does Brazil play in this story, particularly going forward? Isn’t exercising their right to free movement just what (young) people should do to create a better future for themselves? Isn’t moving to a country with better outcomes for inhabitants one of the few ways to hold bad government accountable? Absolutely Ralf, I completely agree, and would never criticise anyone for going. In fact it’s been some time now that I have answered the question I often get from people here in Spain “I have a son/daughter who has just left university and can’t fin a job”, my answer is immediate “leave, this is a country now only fit for old men”. But, have you ever heard of the tragedy of the village pond (or commons). If too many people exercise their right then the right eventually becomes worthless. It isn’t the young people leaving who worry mean, but the older ones who stay in societies that become unsustainable. It may be the politicians fault, but it’s the ordinary citizens who get to carry the can, and then a Europe with such sharp divisions eventually falls apart. Is this really in our collective interests. Oh, I know, why should I care, I’m alright Jack. Great article! I agree with your verdict, but what about the solutions? How do you improve this demographic situation? Some form of child benefits? Can Portugal or Spain afford new welfare state programs? Do you have examples of countries where these kind of policies worked? The way i see it, probably the only available solution for this countries is to attract more migrants, but this is a political hot potato now in Europe. And, of course, with unemployment at more than 25% is hard to attract any migrant worker at all. So if it´s true that in order to resolve Spain´s unemployment problem there needs to be a 20% reduction of real wages, then in order to create new jobs fore some desperately needed 1 or 2 million immigrants you´ll probably need to have some 30% reduction in wages(ceteris paribus). Well, good luck selling this idea to the Spaniards. PS – I am also a foreigner living in Barcelona, so it´s easier for me to talk about Spain rather than Portugal, but I believe the situation is basically the same in both countries. I don’t really believe the 1 million in the last decade number, but I’ll believe half that. Interestingly, if the population is shrinking, it does make the economics data over the short term not look as bad on a per capita basis. Over the long term, it’s absolutely catastrophic. That age pyramid is not even a pyramid. Note that the numbers of people leaving includes many which return 6 months to a year later. I do agree that better numbers would be a good thing. Hi Luis, I agree that in the short term people leaving not only makes per capita GDP look better, it slows down the rise in unemployment. Your Prime Minister isn’t the only political leader on the Southern Periphery who thinks this, but typically, like many politicians they are putting expediency before the long term interest of the country. On people coming back after 6 months, well look, I can’t speak about Portugal but here in Spain that has been the historic pattern. It even went back to the migration to Germany and Switzerland in the 60s and 70s, many in the end came back. But they came back to a job market that was improving, and to a country with a bright future (in the 1990s at least). But, as the saying goes, this time seems different. Unemployment in Portugal still looks far from its peak. In Spain and Greece at around 27% it is probably peaking. But it is highly unlikely that we will see growth this decade which will really bring the unemployment down to reasonable levels. So what would they be coming back to when there is work, and better paid work, elsewhere? Indeed, just how many of the Portuguese who left for France in the 1990s actually came back? These economies need a major “jump start” to turn investment and the labour markets around, but Europe’s leaders seem too complacent to take such a bold step. And anyway, Germany is a net beneficiary of all this, while restarting Portugal, Spain and Greece would mean higher unemployment in Germany. Where’s the incentive for the politicians? I don’t have an instant solution to this problem. Indeed in the long run I don’t think there is a “solution” as we currently envision solutions. You are quite right that raising child benefits (which I think we should do anyway) will now be very hard since there is such demographic pressure on health and pensions. Policymakers were warned this was all coming several decades ago, but as in so many matters they took no notice. Children are an investment in the future of a country, so I would have thought the implications of not having enough children to support a growing elderly population should have been obvious, but obviously it wasn’t. But all these measures, including immigration (where will China get the immigrants from, the “Chinese problem” is only a decade away) only buy time, they don’t give a solution in the classic sense. One day or another every society will have a “topsy turvy” pyramid. Some seem to think having robots instead of children is the solution, but I’m not sure they have thought through all the social implications of this. On the other hand, maybe robots would do a better job than the current politicians. The conclusion I think we can draw though, is that most of the policy measures being advocated by mainstream economists won’t work, whether they be advocating austerity or stimulus, since neither of these address the underlying fertility issue (it is beyond the bounds of monetary policy). If I am right and it is these epochal swings (demographic dividend and then demographic penalty) which lie at the heart of our current difficulties, purveyors of both these classes of policies are misleading many, many people, because they are suggesting they can create a sustainable, self sustaining economic recovery when they can’t. So the solution lies in part in adaptation and acceptance. But voters are a long way from this point at present, so we are seeing increasing volatility in the political system as people are expecting something they can’t have. Maybe it is better to think about the demographic issue in a similar way to the climatic one. It is something that is happening, that will happen more quickly or more slowly but it will happen. We are the agents of at least part of this change, but there isn’t much policy can do about it. We come from an age where it was thought policy could solve everything, now we discover it can’t. But that doesn’t mean we can do nothing. There are specific measures we can take that will help. Naturally some countries can benefit to the disadvantage of others. Those who wake up first to what is happening will be the main beneficiaries. On the other hand, does it make sense at the moment that so many people in the UK are getting worked up about Bulgarians and Romanians coming to the country to work. There is a long long road to travel on this front. Maybe seeing what gets to happen in Japan and then subsequently in China will help concentrate peoples minds. Very interesting article as it puts together the major stress factors of the Portuguese society/ economy. I was curious about the close look by an English author until I learned you live in Barcelona- so close! 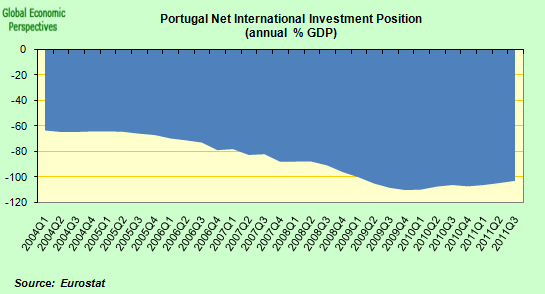 The numbers for foreign investment are awful, and it seems that it’s one of the big issues, not only in this country. The financial turn to the capitalism in the last two decades turned normal, moderate rates of retrun on capital not acceptable by the greedy owners of capital assets; even before the crisis, portuguese capital was flowing to other geopraphies where returns were bigger. This problem is never addressed properly and it’s pf huge importance in the long run for the other indicators you point out: no investment, no new jobs, no new jobs for young people, less mariages, less children, emigration in despair, unsustainable accounts, degradation of demographic balances, unsustainable social security, and so on… Good work! I’ll be back . 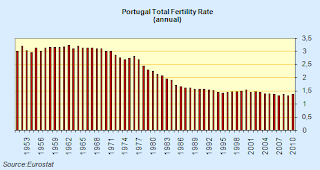 From the migrations of the 1960s, I think a significant fraction went back to Portugal, often at a later period in their lives (retirements or semi-retirement). As to recent years, I have no hard data. I have anecdotal evidence from my circle of friends/family/acquaintances that several people have left and come back six months or a year (or 2 years) later. Some people seem to spend a few months in Angola semi-regularly without wishing to permanently move there. Switzerland is another favorite for these trips (might be visa-related). I do not know how representative my circle is, however. Obviously this numbers don’t reflect what’s happening since around 2010, so things are worse now. But just like Luis Pedro Coelho said people that leave wont necessarily stay abroad. It’s obvious for example when you look at people that go to Angola to work in a 6 month project and then come back. In the statistics they show as people that left the country just like any others. In conclusion, i agree with the problem, but the numbers aren’t exactly the ones you have here. “Problem” “Dangerous” Where exactly is the problem? Isn’t everything within these two sentences assumptions based on faulty reasoning? 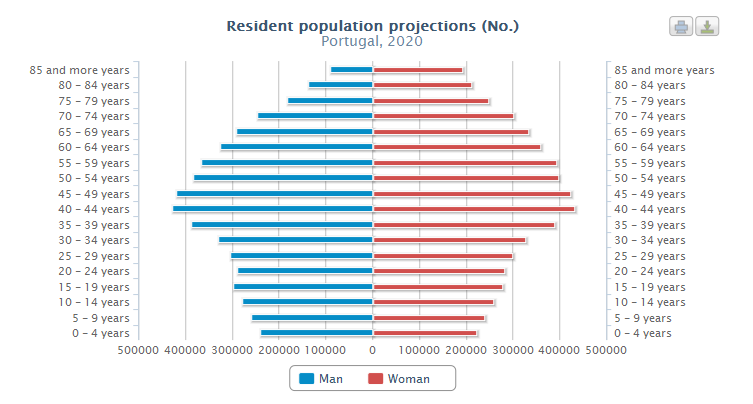 If Portugal has N population how does having 2N or 3N make it ‘better’? Is better or worse numbers on a chart of a computer screen? Do we live as slaves to our economic indicators or are we free men, or is that simply another finance fraud? The assumption is made that younger workers are needed to pay retirements of older workers when such payments are universally borrowed. The assumption is made that nations repay their debts when such payments are always rolled over into greater debts or defaulted upon when nobody is paying attention. The cultural assumption is that more is always better but more commercialized waste ultimately ends with capital exhaustion, there can be no other possible outcome. Seeing so far the sentiment of the public and the favors granted to the toys at every fork in the road, it is likely the diminution of the numbers of humans will be swift and shocking indeed. Nice text, but you missed two things: 1) in the first half of the first decade of the 21st century Portugal (and for the first time in its recent history at this dimensions) was an immigration country with estimates from immigration supporters reaching about 500k people coming from mainly Brazil and Eastern Europe; 2) the seriousness of the immigration – I work in IT and having people moving out is something normal in my professional circles, normally in the first 5 years after college. But, in the last two years I saw more than 20% of my contact list get an international phone number, and in the last year it went from single people to married couples with children that are under 7 years. The difference in these moves is that they include a commitment to move for at least a decade while their kids are in school. They’re not coming back easily. From your other posts on this issue I understand that you are not a big fan of fiscal stimulus to raise demand and production, right? However, to continue cutting the budget only depresses the economy further and so more and more people will leave, unless you believe in what Krugman calls ´the confidence fairy´. I understand that you are worried about the longer term sustainability of debt, but trying to cut it now only worsens the outflow of people (apart from shrinking the denominator in Debt/GDP, so also worsen debt sustainability in the short term). Never assume that social convention is immutable or inviolate. The particular distribution of goods in a real economy is *always* the result, however indirect, of social convention. The distribution of wealth, and of the income that generates it, is *always* the result of social convention. Even supposedly natural rights such as to own personal, real or intellectual property are social conventions. Present social conventions favor strong exclusive ownership of property and a debt-based economy because that works for the most influential who have in turn convinced most people that it works for everyone. If average citizens were to become less influenced by those who gain the most, perhaps by purging themselves of juvenile Horatio Alger fantasies, conventions would undoubtedly shift toward more equitable schemes oriented more toward providing the desired results and less toward playing a rigged game out to the end. To suggest that one can’t take care of the elderly and disabled without economic and population growth is tantamount to suggesting that one can’t bake a cake without any ounces. It’s facially silly in the latter case, but strangely accepted in the former. If it isn’t happening but clearly could happen, it’s because we have chosen not to make it happen in favor of something else. 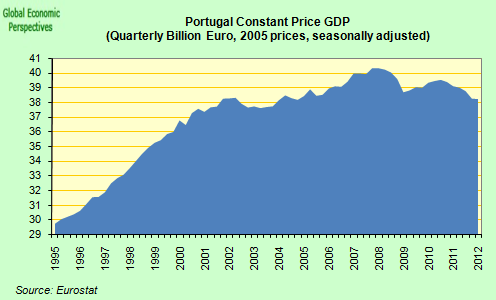 Portugal population decreases, work decreases, income of country and there for unable to pay debt off. Leaving Corps to buy off Portugal independency in every way. The population will migrate to other countries and mix with those people eventually causing the culture to disintegrate and become obsolete. Spain will take over Portugal and enforce the remaining land to be Castilian in culture. As for the language, it will survive but just not as ‘Portuguese’ as Brazilian. Such a Shame though I do enjoy the Portuguese culture ever since the days of Neolithic paganism they believed in god of security & medicine.They are leaders in healing of the environment such as recyclable energy & resources as far back as the medieval age. Also leading in peace keeping all around the world and helping former colonies that don’t even belong to them establish themselves. And Many more great Modern era accomplishments.